It’s nearly time to harvest the rice in the fields behind Toyonagakura. 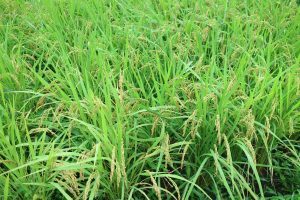 When you think of top quality rice for making Japan’s finer drinks, Southern Kyushu is generally not one of the first regions that comes to mind. There are several active volcanoes in the area, and rice does not grow comfortably in soil with a high ash content. That is part of the reason that Southern Kyushu has become synonymous with sweet potatoes, a vegetable that is happy just about anywhere you plant it. But the Hitoyoshi Basin is lucky, blessed even, and that’s where you can find Toyonaga Distillery, right out at the edge of it. The basin lies almost equidistant from both Mt. Aso to the north and Sakurajima to the south, two of Japan’s most active volcanoes. The former is among the world’s largest while the latter experiences several eruptions every day. Thanks to topography and weather patterns, the Hitoyoshi Basin is only lightly dusted by the resulting ash plumes, and has long been considered some of the best farmland this far south in Kyushu. Toyonaga Distillery, in business since 1894, sources all of its rice from the basin, grains that are affectionately known as kuma mai (kuma rice). 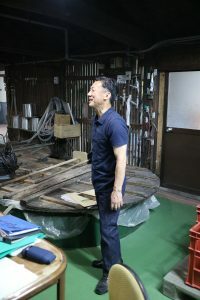 Toyonaga-san, the distillery president, surveys his bustling operation. But Mr. Toyonaga, the fourth head of the distillery, takes this a step further. He uses only organic rice for his awardwinning flagship brands, and the distillery’s namesake brand has been available in the United States for more than a decade. In fact, Toyonaga Distillery’s main vacuum pressure distilled brand again came home with a couple of medals at this year’s Los Angeles International Sprits Competition, an admirable accomplishment for such a small distillery. Of course, the plaudits don’t come easily. precision. Mr. Toyonaga stresses that the steps before koji propagation are particularly underappreciated. First and foremost in his mind is carefully steaming the rice. Ensuring uniform moisture content during steaming allows for even penetration of the koji fungus that is used for saccharification. Such painstaking attention to detail is undoubtedly one of the reasons why Toyonaga Distillery shochu is so well respected both in Japan and abroad. Having tasted some modest success in the American market, especially on the East Coast, Toyonaga Distillery is now producing new brands. First was an aromatic barley shochu, Mugi Shiru. Barley shochu is quite the rarity in Kuma Shochu country, but it’s an award-winner in its own right. Additionally, following up on last year’s limited run MK-I rice shochu success, MK-II is ready to hit the shelves. These more experimental batches, which actually use the word “prototype” on the label, exhibit more pronounced aromatic profiles and have become something of a collector’s item in Japan. 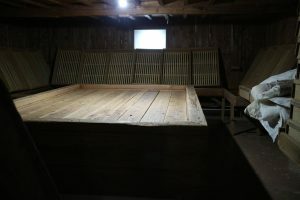 The koji muro is the heart of the distillery. It’s where the koji rice is painstakingly cultivated. And like many other shochu makers in Kyushu, Mr. Tokunaga made sure to start experimenting with barrel-aged rice shochu several years ago. One of his newest labels is the dark amber Okukuma which is a delicious seven year cask-conditioned rice shochu with a 40% alcohol content and dark amber hue. With his son currently employed by the distillery, Mr. Toyonaga has a keen sense of both Kuma Shochu’s past and present. Overlooking the patchwork quilt of rice paddies from the rim of the Hitoyoshi Basin, he also knows that shochu’s future will likely run straight through this volcano-flanked valley.